Home ice wasn’t too kind to the Habs this past week as they struggled to score in two of their three games and as a result, they were only able to pick up a single victory. Oct. 30: Dallas 4, Montreal 1 – The Habs came out strong but weren’t able to beat Ben Bishop early on; Artturi Lehkonen couldn’t get a shorthanded penalty shot to go and that ultimately was the turning point. Dallas scored on that power play and once more before the halfway mark of the second and tacked on a pair in the third for good measure, the last of which came from Alexander Radulov who curiously was healthy enough to play this one before being immediately shut down once again. Nov. 2: Montreal 6, Washington 4 – This turned out to be quite the game. Montreal jumped out to an early 3-1 lead before the Caps picked up three unanswered in the second to take the lead. It looked like that might hold up before Jesperi Kotkaniemi potted his second of the night late. After that, Max Domi (who wore the goat horns for his meltdown the previous game) scored the winner in the dying seconds while Joel Armia popped an empty netter right after, setting a new NHL record for the fastest two goals by a single team in the process. Nov. 4: Tampa Bay 4, Montreal 1 – Domi picked up where he left off as he scored in the opening minute to give the Canadiens some early life. Eventually, the Lightning found their skating legs and dominated the back half of the opening period, scoring twice in the process. 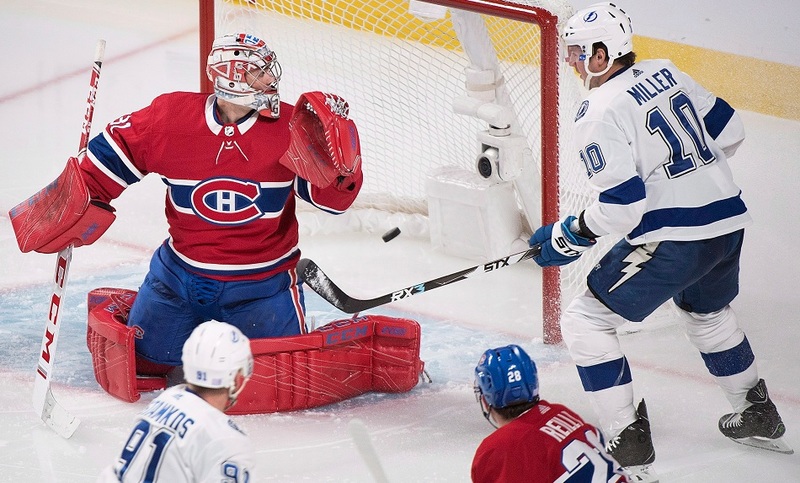 While the Habs were a bit better after that, they weren’t able to get another one past Andrei Vasilevskiy and Tampa scored twice in the third to put it out of hand. - Paul Byron suffered a lower-body injury against Dallas and while there was some thought he could return Saturday, he sat that game out and has already been ruled out of the first two contests for next week. With Nikita Scherbak on a conditioning assignment (that isn’t going very well), there aren’t any spare forwards on the roster for now. Byron could be placed on IR retroactively to free up a spot for someone not named Scherbak to come up from Laval. - Tomas Plekanec (back) skated with the team on Saturday which suggests he’s nearing a return to the lineup. Meanwhile, David Schlemko (knee) is expected to skate with the team sometime this coming week. Assuming no one on the back end gets hurt between now and Schlemko’s return, the coaching staff will soon have a decision to make on who goes to make room. - Mike Reilly has cooled down offensively as he has been held off the scoresheet in seven straight games. Worth noting is that after averaging 22:36 through his first nine games, his ATOI has dropped considerably to just 18:00 per night in the last four games. While he played over 20 minutes in each of those first nine games, he has yet to do so since then. Nov. 5: at NY Islanders – The John Tavares-less Islanders have gotten off to a better start than a lot of people expected as they sit atop the Metropolitan Division. Mathew Barzal has picked up where he left off while Josh Bailey and Anders Lee aren’t producing any less without their old linemate in the fold. Robin Lehner is dealing with a back issue so Thomas Greiss is the likely starter for the Islanders and he is very quietly among the league leaders in GAA and SV%. Nov. 6: at NY Rangers – Given their fire sale last season, it’s not shocking to see the Rangers near the bottom of the standings despite getting decent goaltending from Henrik Lundqvist. Brett Howden has been an early surprise for New York after coming over in the Ryan McDonagh trade last season while Chris Kreider is now healthy and is leading the way for them in the goal scoring department. Nov. 8: vs Buffalo – The Habs will be looking for a small measure of revenge after Buffalo beat them late in October. Jeff Skinner has fit in quite well so far while Jason Pominville is playing like he’s 26 instead of 36 as he is shockingly averaging a point per game. Keeping pucks out is still an issue for them but the Sabres are outscoring some of their defensive woes early on. Nov. 10: vs Vegas – It’s the return of Max Pacioretty, assuming he’s cleared to play by then after missing four straight games with an upper-body injury. The Golden Knights have had issues scoring all season long as it turns out that some of the players that many believed were playing over their heads last season actually did play over their heads. Despite a team save percentage under .900, Vegas has been able to keep the puck out of their own net most nights so this one has the potential to be a low-scoring affair. Losing two of three has taken away some of the early optimism from some of the fan base which surprises me a little bit. Yes, they’re having a nice start to their season but this was a particularly tough week. Sitting here writing this column last week, I thought one win would be decent considering the quality of the opposition. Hard work is nice and has kept them in a lot of games but talent still matters and Dallas, Washington, and Tampa Bay have a lot more of it than the Habs do. I don’t think it’s particularly bad to lose two of three to them; it’s not great but it isn’t really cause for concern either. One month into the season, the Habs have exceeded most expectations and have done so without their top defenceman which is particularly impressive considering the state of their back end. One week of non-ideal results shouldn’t change that too much. This has still been a solid start to the year for Montreal.